Why does Women for Women International work with men? As early innovators of programs to engage men, we know that for women to achieve full equality, men have a critical role to play. 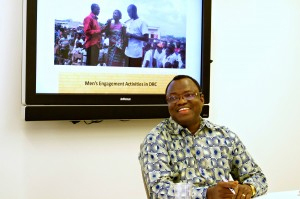 To increase awareness on how men contribute to women’s empowerment, Women for Women International held a seminar in its Washington, DC office on April 10th. The session featured special guest Jeremie Ouangrawa, WfWI’s former Country Director for the Democratic Republic of the Congo. Sharing lessons with WfWI staff and practitioners from organizations like ICRW, CARE USA, and UNICEF USA, Ouangrawa discussed why engaging men can promote women’s equality. Since its first men’s engagement program in 2002 in Nigeria, WfWI has championed men’s role in supporting opportunities and access for women. Today, WfWI has reached over 7,500 men through innovative programs in Afghanistan, Nigeria, and the Democratic Republic of the Congo. WfWI’s men’s engagement programs transform relationships and challenge ingrained practices and beliefs. They create an opportunity for men to understand how inequality and abuse hold women back and harm the entire community. This fosters a dialogue between men and women to develop solutions. For years, WfWI’s men’s engagement programs have focused on outreach to male community leaders, including law enforcement and traditional, religious, and civic leaders, who can use their influence to promote greater respect for women’s rights. As it works to continually enhance its men’s engagement programs, WfWI recently began outreach to the husbands and male relatives of program participants. In the DRC alone, WfWI will train 1,200 male family members this year, in partnership with ProMundo. This new effort to reach male relatives helps support women as they go through the yearlong program and beyond – as they work to achieve their goals and create healthier family environments for their children and stronger, more equitable communities.